This has to be one of my favorite maternity session's I've done. I love how the light was like ... PERFECT for this session! This lovely woman and her son (who happened to be my neighbors) headed to the middle of no where with me in the morning and we found this wheat field. It was perfect. The main goal of this session was to document a big brother's role in his family while his daddy served our country overseas. And mommy's father is a professional photographer himself, no pressure right?! The only thing that would have made this session better, was to have daddy home for the pictures. Daddy is home now, but not without suffering an injury. He lost his right leg serving as a medic for the 82nd Airborne Division, while on a foot patrol in southern Afghanistan. He stepped on an improvised explosive device (IED) that took the lower half of his right leg. He also took significant shrapnel to the back of his left leg, minor shrapnel to his right arm, and to his chest. He is currently recovering at Walter Reed National Military Medical Center with his family by his side. Friends and family have come to his aid by putting together a couple of fundraisers in his name to help out the family with their recent move to Washington, D.C. and his recovery time. Please take the time to check out and/or give your support to the family HERE and HERE. Gorgeous right? A lovely family and I'm going to miss them as they continue to the next stage of their lives. I wish them the best of luck and support them 100%. Thank you for your service! 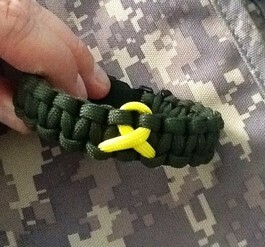 This survivor bracelet from Bud's Paracord Bands not only shows your support to this one brave soldier but also shows your support for all of those who serve in the military and protect our country. SWP is proud to support our military members through my personal service, my family's service, Operation: Love Reunited, my military discounts, and volunteerism with military support groups. Please, the next time you see a military servicemember, thank them for what they do. It's a tough job and I'm glad there true heroes out there.